They call it the Valley of A Thousand Hills. 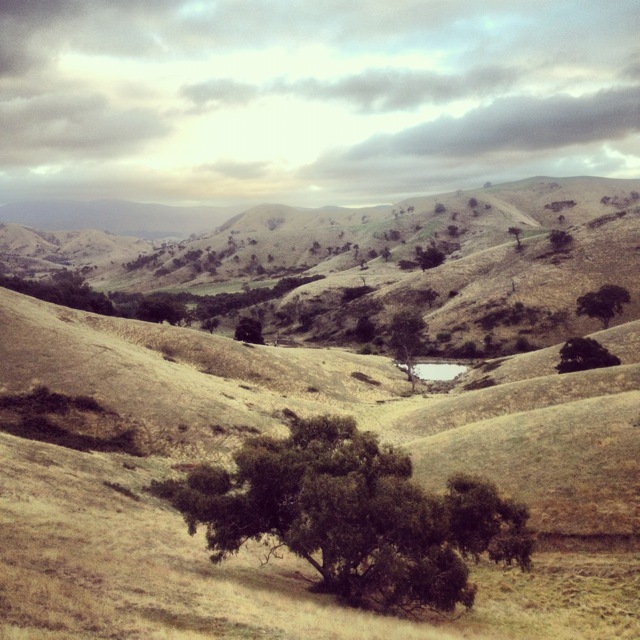 It’s about 80 minutes from Melbourne, but it feels like another world. A place out of time, and a place that gives back the time you felt rushing past you, away from you. I’d been feeling fraught and helpless; impotent to help people I love, and overcome by world events. Fear was edging in, coupled with a gnawing, undirected fury. I was waking in the night wondering how to rescue people from the fallout of Europe’s financial crises, or rehashing images from TV coverage of the horrors in Syria. 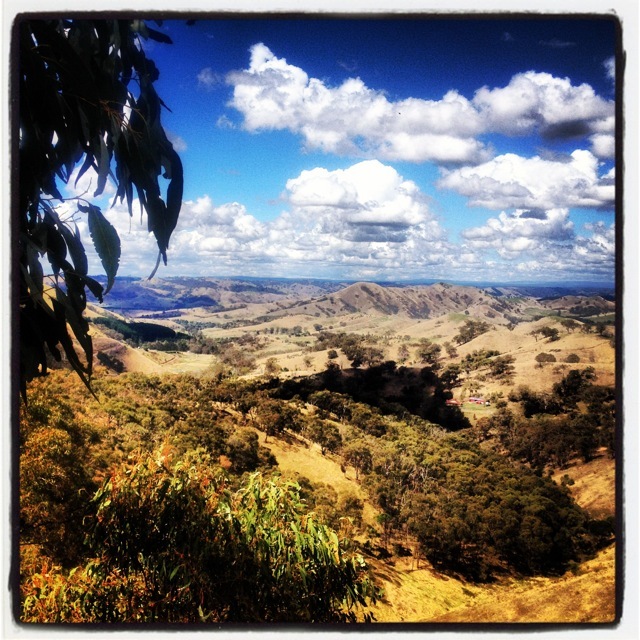 Constantly asking that same old question – What can I do? It’s restorative, a bit of perspective. Nothing like being reminded that I’m just a speck, and that the best thing I can do is to settle the mind, and to step back, to take some space and time, and to be still. I’m returning now to the land of news cycles and bloggofaces. I’m taking small slow steps to understand what I can do that will be productive. Useful. Practical. I will get my house in order so I can be of benefit in some small way. I can make a difference, no matter how small, but not when my angry mind is rattling at its cage. But I’m grateful to anger. It’s the thing that propels me in the first place. It’s the sin that makes me move, that reminds me I have to DO. It’s a sin with virtues, sometimes! 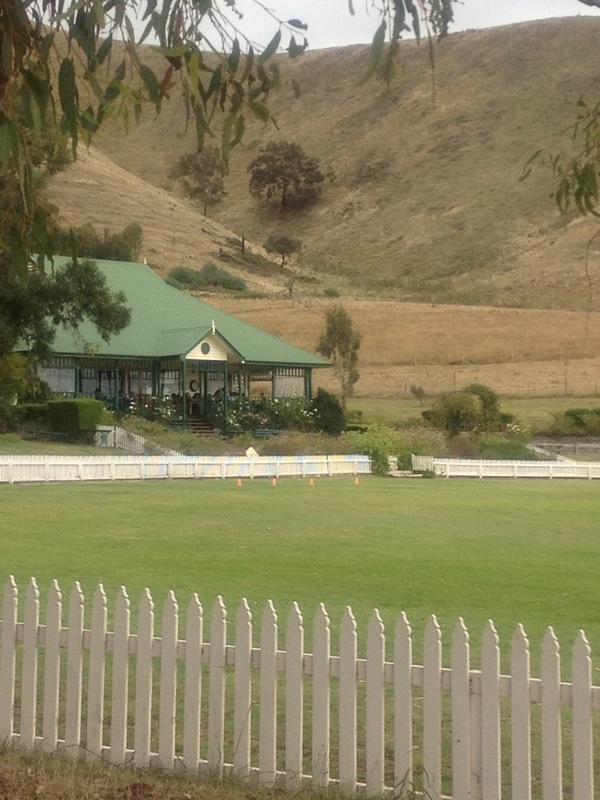 It’s the Hume and Hovell cricket ground! 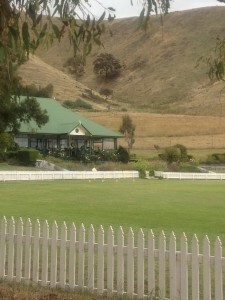 A perfect cricket pitch, deep green and lush, with a Lords-like pavilion and a cafe serving delectable food. Behind it there is a bunk room that can house two cricket teams! It’s just like a refugio on the camino, and I felt I’d come home. Bunk beds, views for days, and roads leading to the hills. And at day’s end…cricket, of course. And best of all, in the Pavilion Cafe, Chris’s poached eggs! Ask him how he does it. Your mouth will pop open. In fact your mouth will pop open for all of his treats! I recommend the oven-baked tomatoes. I wish you space and time. The greatest luxuries on the planet. As the sin-carrier and keeper of confessions, I can’t divulge. Or maybe I will just send people to see for themselves!